Please join me on my journey! My annual rite of passage begins at 7:30 EST on this Saturday, February 2nd. It is on Saturday when my local YMCA 10K Training Team begins our training for the Monument Avenue 10K in Richmond, Virginia on April 13, 2019. Since Christmas, I have been doing three short, light and rather slow runs in an effort to shake the cobwebs out of my joints and muscles. But on Saturday, I begin training with a team that will add some direction, support and accoutability. As a sufferer of Rheumatoid Arthritis(RA), my intention is to use the training team to prepare for running (slowly) the 10K to prove to myself that in-spite of RA fighting against me, it can be done. Hopefully, along the way, I can inspire someone to be more active in spite of battling a chronic illness. Once again, my weapon of choice will be the Saucony Guide 10, a stability shoe that is light, supportive and fits me just right. You can see in the photo a highlighted block of foam that is part of the supportive sole. This block prevents over-rotation of my ankle on landing (I overpronate, meaning I land on the outside edge of my foot and then my foot rolls inward beyond 90 degrees--this causes all sorts of ankle and lower leg problems). 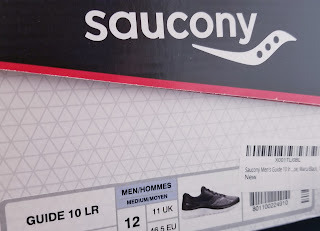 One of my most important recommendations is to find a local running specialty store and go there to be analyzed and fitted for the "right" shoe for you. I made the horrible mistake of going to a big box sports retailer and picking a shoe to looked cool. I grabbed the size that felt good and went about destroying my feet and ankles. Specifically, because of #overpronation, I was experiencing terrible pain on the inside of my ankle and along the bone of my lower leg. The red markings show where I was feeling pain before finding the right shoe. After mentioning my painful lower leg to a friend, she asked if I had been properly fitted for shoes and pointed me to a local resource. I went in and was analyzed, shown video of what was happening when I run, and I was introduced to stability running shoes. If you happen to be in or around Central Virginia, I can't recommend highly enough that you visit Lucky Road Running Shop #LuckRoad ( I went to the location at Willow Lawn). It was there that Jeff, the owner, took time to show me the error of my ways and point me toward a new existence with my training. The owner and everyone working in the store loves running and loves to help customers succeed at running. You can feel their love in every encounter. After trying multiple stability shoes and narrowing down to two styles that I liked, and seemed razor close on fit, I was torn on a decision. If you find yourself in similar circumstances, try one of your two favorite shoes on each foot and run around the store or around the block. The cream will rise to the top and one shoe will stand out clearly for you. For me, it was the Saucony ProGrid Guide. I loved them so much, I purchased a few pairs to have in storage and ready to deploy for fear of future iterations not giving the exact same fit. On Saturday morning, I will dust off the Saucony's again and work toward a 10K. Follow along, I will share my training schedule, runs, times, and weight to see if I make progress moving toward the race. I go in knowing that RA has taken its toll....more so from the standpoint of the fatigue it induces than the joint pain and destruction that it is more well known for. If you are an RA Warrior, casual runner, or just an interested party, I invite you on the journey with me. I also encourage you to share any tidbits, tips or insights you may have that would help me, or other readers, along the way. If you have been following me, you will know that shortly after the start of 2018, I began to train for a 10K here in Richmond, Virginia. I joined the YMCA 10K Training team and the team met each Saturday for our long runs. We had a roadmap to follow all the way up to the week before the race. It worked like a charm, and my daughter and I completed the 10K on a picture perfect Spring day. I'm happy to report that the training had a significant positive impact on my composition. I went in for a Dr. visit last week and later I got my electronic report of the visit. I noticed in looking back that prior to starting the training team, my weight was 230 lbs(lifetime high water mark) and at the visit last week, I was at 213. Nothing incredible, and certainly not a quick and easy weight loss plan, but it was nonetheless a hard-won victory. One of my gifts for Christmas this year was this simple but elegant Sharper Image diffuser. I have spent time over the past few months working on mindfulness and meditation as well as biohacking and self-improvement. Will all of this lead to a better me? I'm not sure just yet, but I am having a lot of fun trying and learning about myself. I do a significant amount of travel as part of my career. What initially felt like a bonus in earlier years has become a burden since the onset of Rheumatoid Arthritis. It certainly has changed the way I view travel, as well as the way that I prepare for and carry out travel. I enjoy travel and enjoy visiting new places even if much of my travel is very "quick turn" in nature and I sometimes see just a dash of the location I am visiting. I travel between 35 and 40 percent of the time. As I've gotten older, I have enjoyed it less merely because I have grown to value downtime with my family more dearly as my kids get older. Since being diagnosed with RA in 2010, travel has steadily become more of a burden due to pain, lack of mobility and sheer fatigue. If you are recently diagnosed, or have long fought RA but are nearing a period of travel, I am hopeful some of what I have discovered can be of use to you.